If you go for the abundancy of wildlife, do not go to Andringitra. Lemurs and birds are there, but a rare encounter. 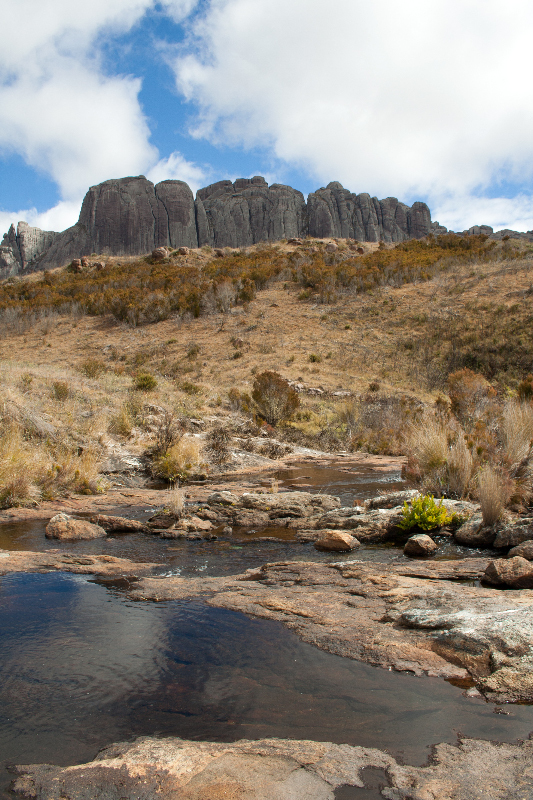 You go to Andringitra for the diverse and stunning landscapes and mountains. You can only get there if it did not rain recently, or the road will be inaccessible. Do not forget to bring your own food and supplies as well. But when you are prepared for a full day hiking, you will be rewarded. Mountains, cliffs, waterfalls, all colours of rock, puddles, high altitude plants, montane bonsai forests. The light constantly plays with the landscape. It is breath taking. From the mountain pools right up to the cliffs. The tranquility, the beauty, the diversity in shades of orange and brown in the scrubs and grass. Just by glancing at the photo, I’m back again.